The earth, flames, waves, and wind that make up all natural landscapes might seem like mere backgrounds for characters' heroics, but those who understand the fundamental makeup of nature know that these core elements can lend incredible power. Learn how to harness the building blocks of existence with breathtaking feats, magic items, spells, and much more. 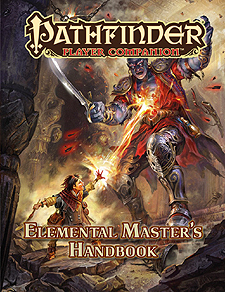 Plus, characters with an affinity for the elements can train in one of the many archetypes and other character options presented in Pathfinder Player Companion: Elemental Master's Handbook. The genie binder prestige class, which grants elemental maestros a pool of charismatic gumption when cowing genies to their will and allows them to create elemental seals of power. New archetypes, from the weapon-enhancing flamesinger bard and the breathless Abendego diver ranger to the mystical stone-wielding earthshadow rogue and the hurricane-punching windstep master monk. New kineticist feats, infusions, and utility wild talents that coalesce the power of the elements, including those that harness the esoteric void and wood elements.